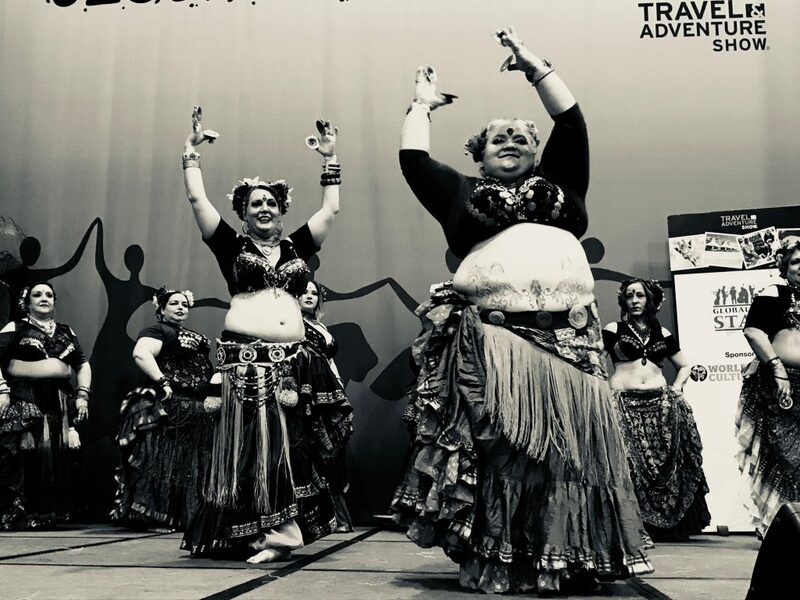 Most of you know that I teach American Tribal Style® (ATS®) bellydance. Just in case someone misses my announcements elsewhere and is just checking in on me at my blog, I thought I might do a bit of cross-promotion. 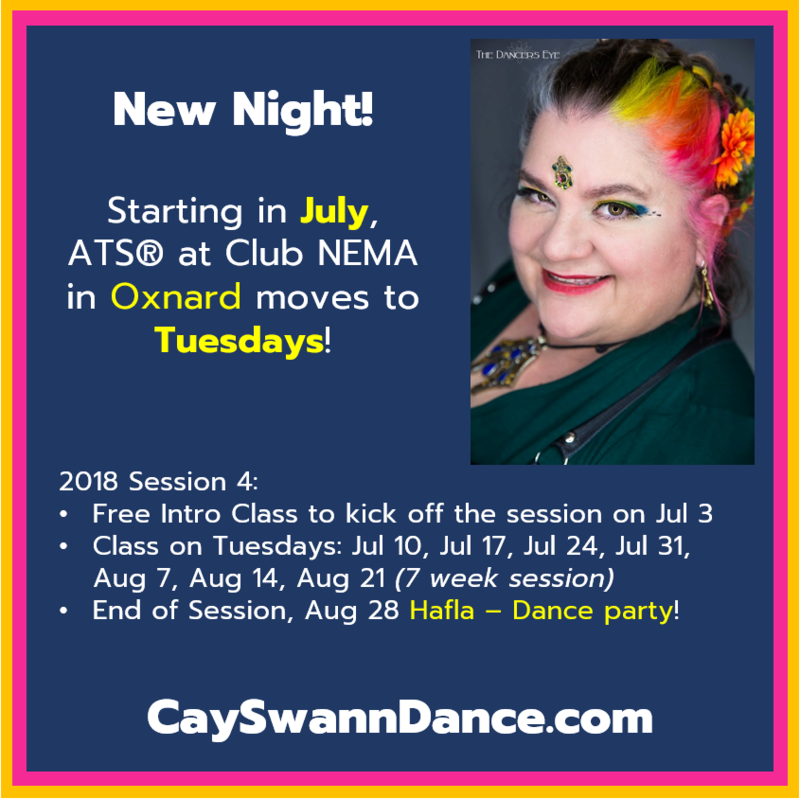 Free Intro class to kick off the session on Jul 3! I posted this summary in several places yesterday. Okay, something crazy I have to warn you all about. Apparently, when someone challenges you to do something you thought you couldn’t do, then you successfully DO THE THING you thought you couldn’t do, and then YOU’RE NOT DEAD afterwards, you JUST MIGHT start thinking afterwards about other crazy things you thought you couldn’t do and now you’re gonna DO THEM. You know. In case you needed a warning. Doing stuff makes you start to believe you can do stuff. I feel it deserves a longer journal post to describe what I’m talking about. Then she sent me the music and the plan for the show: 13 songs, 45+ minutes on stage. Maybe this doesn’t resonate with the uninitiated. Up until now, performances I have participated in have ranged from 6 to 15 minutes long, max. And those are exhausting. We put our whole selves into the show, partially BECAUSE we do an improvisational dance form. We cannot let our minds wander. We have to stay alert and ready and thinking, as well as performing physically. I’ve also only participated in a specific class-format called “Flow” a few times. It’s set up as 60 minutes of non-stop dancing, in sets of 15 minutes (with short breaks to grab a drink of water). The first time I tried to do flow, I barely lasted the first 15 minutes without dropping my arms. By the last set of 15, I was sitting on the floor, crying, and trying to keep up with some of the arms work. (Granted, my knee was in the worst shape possible at the time and I’d just danced for 2.5+ days of workshops. But still.) A year later, I made it through most of Flow without dying. But my new job has a long walk between parking and my building, and I still don’t like to do the entire walk without stopping at least once to give my knee and back a moment’s rest. How in the world was I going to keep up with 13 songs and 45 minutes of dancing, no breaks, with a troupe of dancers who practice together all the time? I started with an ambitious plan to practice my stamina building every day for the 70-80 days before the performance when I was first told about this. But like many “grand ideas,” I let other tasks in life take precedence and I really did not train much. But I do teach 60-minutes at a time. 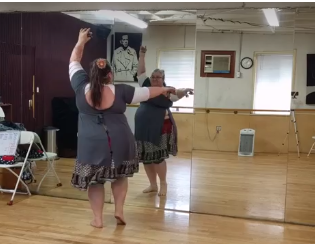 So I kept telling myself that 45-minutes of dancing is still less than 60-minutes of teaching dance, so I would be able to do it. I brought a chair to ensure I wasn’t in pain from standing around for the 1.5-2 hours before the show. And I made certain to take ibuprofen, hydrate sufficiently, and just sweet talk myself into believing I could do it. To be honest, I really was frightened I was going to collapse in tears and pain. One of my favorite shots. I love the juxtaposition between the calm face, solid feet, and that twirling skirt! Obviously, I didn’t die. I didn’t collapse. I didn’t drop out when we were on stage. Marie believed in me. Her whole troupe believed in me. Then I believed in me, and I accomplished something seemingly impossible. The story doesn’t end there. I had to teach the very next day, and I was more than a little nervous about how exhausted I might be. And you know what? I wasn’t any more tired or sore than usual. Class was wonderful, my students were awesome, and again, I did it. Now I’m thinking about an impossible challenge I’ve been wanting for a while now: I want to host and teach/lead a Flow class regularly for any ATS dancers in my area. The “class” is not an opportunity for instruction. It’s just dancing, just following (the leader), it’s just a time to let your body take over and your mind to take the back seat. I’ve been so intimidated by my inability to keep up in Flow at earlier opportunities that I thought it would be years until I could host/lead such a class. But this experience has taught me that I am far more capable than I thought I was. And my students are in for the notion that they would attend Flow and dance for the entire hour. So I’m going to make it happen. All because someone thought I could do something that *I* didn’t think I could do. And I did it. My childhood best friend reminded me yesterday that the Word of the Year for 2017 I had selected was GOALS. I couldn’t remember that a week ago, and then my Facebook memories popped up today with the original post from last year. Kristina was right: It was GOALS. Oddly enough, I attended a workshop called, “Goal Setting for Artists” and came away from there thinking that I should focus on TIME and SPACE in order to achieve my dreams and goals. So I’m comfortable combining them all in my records for 2017. Revisiting, these have been my theme words. Today, I’ve found my theme word for 2018: PRACTICE. There are so many ways to interpret this. When skill-building, one needs to practice the newly acquired skills. You could ask yourself, “What are the habits I’m in the practice of repeating?” Am I practicing compassion? Do I practice patience? Have I practiced forgiveness toward myself or others? Could I practice better habits? Should I change the practice of being hard on myself? Do I practice financial responsibility? Have I practiced good community building skills? 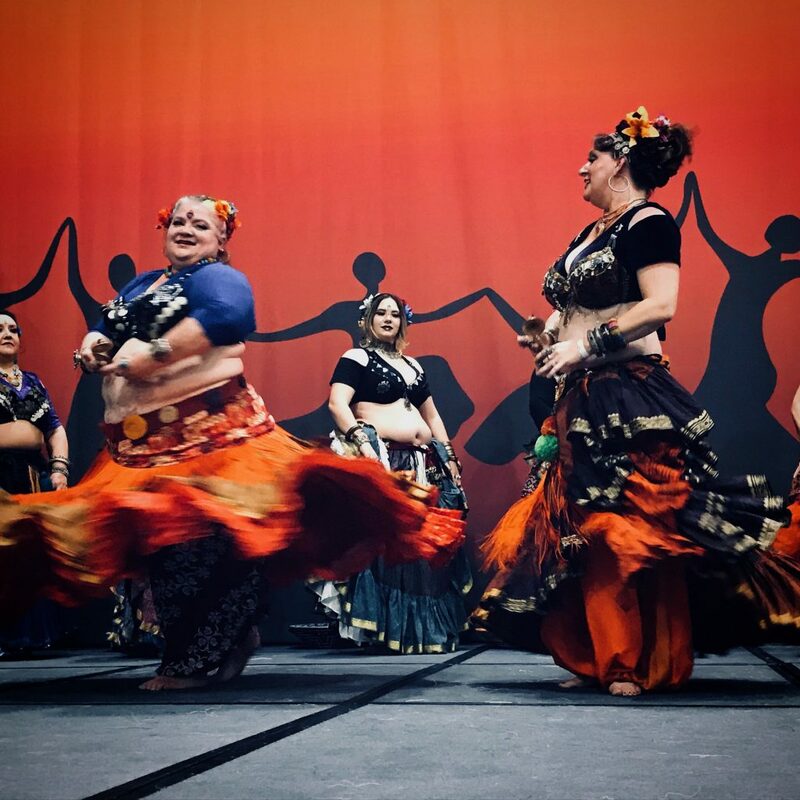 When I think about the various themes I’ve sought to embrace–Dance, Focus, Create, Mastery, Habits, Goals–it’s easy to see how I would then expand this into making regular practice of my pursuits. I want to practice my dance skills. I want to put focus into practice more frequently. I love practicing my various creative pursuits. Practice is the primary method for aiming for mastery. Practice must become part of my regular habits. And I can best narrow down *what* to practice if I have established my goals. Setting my various priorities in place before me, it’s time to then practice what I preach. Vacations are strange things. I spent extraordinary energy to get ready for two weeks away from work, specifically so I could forget about my regular schedule of events. I had to set up calendars to remind my students there would be no classes. I kept two long lists for stray thoughts about what to pack for two completely different events. And then in the midst of each event, I found myself emersed in the experiences this time without regard for lots of photos and/or social media posts. These two weeks have definitely been about disconnecting from regular habits. 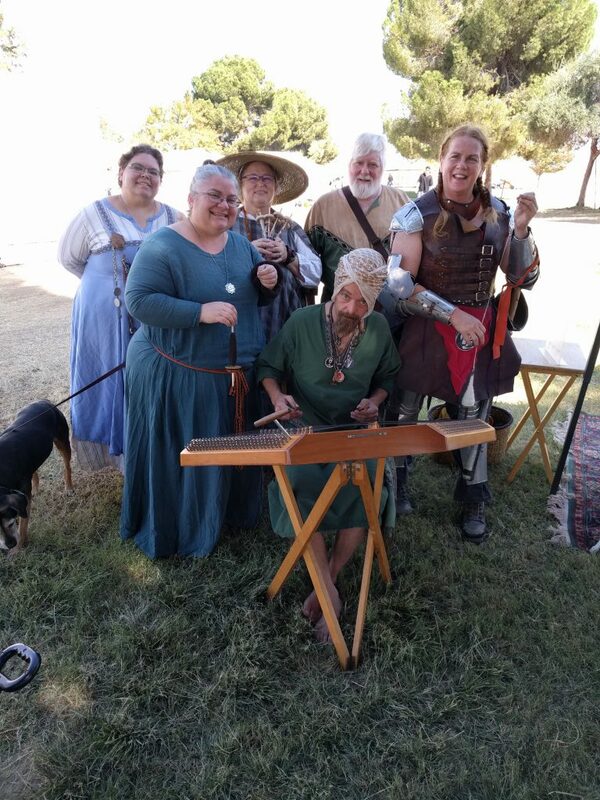 GWW is one of “those middle ages camping things” that I have been doing for years. In the 20 years of this event, I have only missed #2 (1998, or “Great Wet War”) and came for only one day of #19 (2016). I first went on staff in 2009 and this year was the first year I wasn’t involved in *anything* on staff. Originally, my thought was, “Hey Sweetie, let’s pack light, bring almost no gear, and just hotel this war.” Sweetie’s agreed, and then the odd planning began. For two people who are used to bringing tents and cooking equipment and coordinating meal plans, packing for staying in a hotel was an entirely new experience. Sure, it meant less gear to haul and an easier packing job for the car, but during the event we figured out there were some new problems. Parking was a long walk away and so at night someone had to do that walk. With my knees still giving me trouble, obviously Sweetie walked that long distance just to come get me with the car. Shopping was entirely different, since we really only needed lunches and snacks in a cooler on site. He also ran into some confusion remembering which items to leave in a hotel or which items to take on site. “Where’s the sunscreen? Oh drat, I left it on site.” “Did I pack my phone charger and leave it in a tent? Do you have an extra charger I can borrow tonight?” But I will praise the convenience of having a bathroom right there in a hotel room. GWW also coincides with a modern event called Spinzilla. Modern spinners compete against each other and against themselves to spin as much yarn as possible over a week. The money raised by the team’s goes to support kids education programs about textiles. Our team has decided that we try to teach as many people to spend as possible during the week. So this year I spent 22 hours in the Spinzilla booth spinning and teaching people to spin. 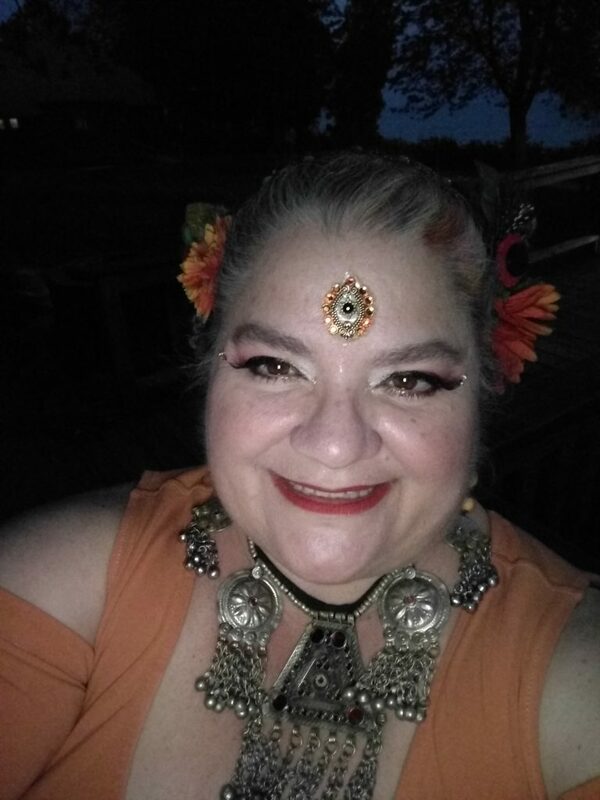 Returning from GWW meant, “do all the laundry!” and then, “pack completely different laundry for all the dancing!” I scheduled a photo shoot for the first evening of the event with my favorite photographer, but I did not make any plans for performing. My knee has still been giving me trouble, so I took it easy and honored those moments when I needed to learn by watching and listening carefully from a side-line. I also had the good fortune of rooming with several different friends from different parts of my dance life. A previous troupe mate came to pick me up from the airport, and she brought me sheets, blankets, a pillow, and a bath towel so I wouldn’t have to fly with them. (Yay!) My hotel roomie twice from Tribal Fest joined us, as did my photographer friend. The four of us were an excellent match, and great fun was had by all. The course work at the event was also amazing. I seriously had to pace myself in order to do all the classes (or nearly all of them). 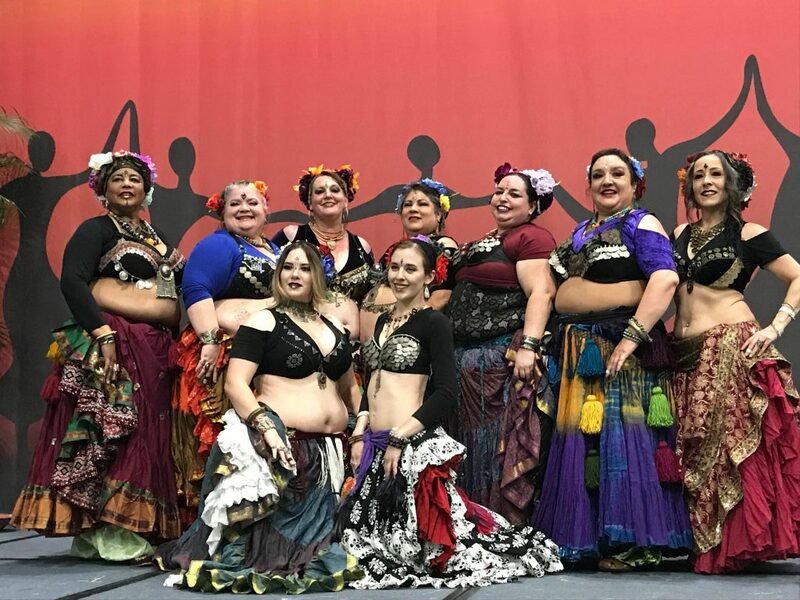 I chose not to dance at the hafla nor in any of the shows, and this really paid off. It meant I was able to last that much longer dancing in the classes. When my knee couldn’t keep up, I sat on the edge of the short stage, and “danced” all the upper arms work for the instruction. And I had the good fortune to be able to be a merchant in the vending room, selling both wooden zills and handspun yarns. I was surprised how many people are interested in my yarn, but sometimes makers never fully understand how much their creations are loved. This is always encouraging to an artist. The videos from the two shows are starting to pop up all over my feed, so I thought it would be worth it to collect them all in one place. As more come out, I’ll add them here.